Thousands of UK schools and offices remained closed today as one of country's biggest public sector strikes in decades got underway here that also threatens to affect the airport passenger traffic. Egypt’s influential Muslim Brotherhood group today claimed that it was leading in the initial count of results from the first phase of historic Parliamentary polls in the post-Mubarak era but also acknowledged that it was facing stiff competition from more hard-line Islamic parties. Secretary of State Hillary Clinton arrived in Myanmar today on the first top-level US visit for half a century, seeking to encourage a “movement for change” in the military-dominated nation. Hillary flew into a little-used airport in Naypyidaw, the remote city where Myanmar’s generals abruptly moved their capital in 2005, in a stark test of US efforts to engage the strategic but long-isolated country. Britain said today it had ordered the immediate closure of Iran's embassy in London and had closed its own embassy in Tehran after it was stormed by protesters. "The Iranian charge (d'affaires) in London is being informed now that we require the immediate closure of the Iranian embassy in London and that all Iranian diplomatic staff must leave the United Kingdom within the next 48 hours," British Foreign Secretary William Hague told parliament. Michael Jackson's personal physician Conrad Murray was jailed to the maximum of four years in the pop icon's 2009 death with the judge lambasting the doctor for his "money-for-madness" behaviour. Giving Murray the maximum sentence yesterday, Los Angeles County Superior Court Judge Michael Pastor expressed shock over the doctor's lack of remorse. Pastor said the evidence in the case showed a "continuous pattern of lies and deceit." For 16-year-old Vineeth Udaya Kumar, from Lakshadweep, the stalemate in the UN climate talks is a sign that individuals need to come up with innovative ways to help arrest greenhouse gases so that the earth’s temperature does not rise above 2 degrees Celsius. The 24-hour strike is expected to disrupt hospitals, courts, job centres, driving tests and council services, such as libraries, community centres and refuse collections. Teachers and heads are taking to the picket lines, affecting almost three in four schools, according to early Government figures. However, it is feared this number could rise. Airport officials expected delays at immigration counters later during the day at Heathrow and other airports in Britain. There were no reports of delays at airports so far, but chief operating officer Scott Stanley at Gatwick Airport said: "Whilst passengers have so far not experienced delays at the border zones we do expect delays to occur at some point today as the rate of arriving flights increases". Passengers, who arrived on flights at Heathrow this morning, said they were through immigration formalities without any delay. Many flights from India arrive in the second half of the day, when delays are expected. The call for strike has led to Air India cancelling four flights to London scheduled for today and Jet Airways issuing advisory asking passengers travelling to the UK to rebook their flights to avoid any inconvenience. BAA, which runs Britain's airports, said last night: "At this stage, we believe that immigration queues for non-EU passengers could be contained to within two to three hours". 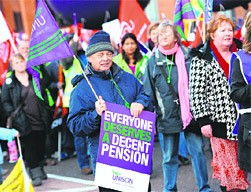 The strike has been called by public sector employee unions against changes to pension rules and job losses. The strike is said to one of the biggest in a generation, and is expected to see over 1,000 demonstrations across Britain. Muslim Brotherhood, which was persecuted and banned during the 30-year rule of President Hosni Mubarak who was ousted in February following a popular uprising, claimed that their new Freedom and Justice Party (FJP) was ahead in preliminary results. 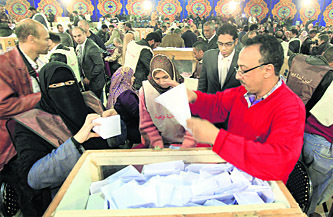 “From the start of the voting process until now, preliminary results show the Freedom and Justice party list ahead,” an FJP statement said after two days of voting for the first phase of polls which concluded yesterday. The Nour Party, comprising ultra-conservative Islamic Salafis, was giving strong competition to the FJP in the Nile Delta district Kafr el-Sheikh and Mediterranean province of Alexandria. The FJP’s strongest showing so far was in Fayoum, south of Cairo, followed by the Red Sea, Cairo and the southern city of Assiut, the statement said, adding that Nour Party was a strong competitor in Kafr el-Sheikh and Alexandria. It did not provide the figures.Liberal-secular alliance called the Egyptian Bloc was also reportedly doing well in some places. 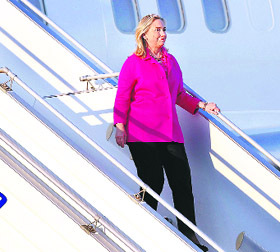 Secretary of State Hillary Clinton arrived in Myanmar today on the first top-level US visit for half a century, seeking to encourage a “movement for change” in the military-dominated nation. Hillary flew into a little-used airport in Naypyidaw, the remote city where Myanmar’s generals abruptly moved their capital in 2005, in a stark test of US efforts to engage the strategic but long-isolated country. Myanmar, formerly known as Burma, has surprised observers with a series of reformist moves in the past year, including releasing opposition leader Aung San Suu Kyi from house arrest and nominally ending decades of military rule. President Barack Obama personally announced Clinton’s trip during a visit to Asia earlier this month, citing “flickers” of hope. But his administration has sought to keep expectations low, mindful of other false dawns in Myanmar. "We have now closed the British embassy in Tehran. We have decided to evacuate all our staff and as of the last few minutes, the last of our UK-based staff have now left Iran," he said. Hague also announced that Iranian ambassadors had been summoned in countries across Europe to receive strong protests over the storming of the British embassy. Britain, locked in a confrontation with Iran over its nuclear activities, has voiced outrage over the ransacking of its diplomatic premises in Tehran on Tuesday. "If any country makes it impossible for us to operate on their soil they cannot expect to have a functioning embassy here," Hague said. 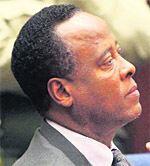 Michael Jackson's personal physician Conrad Murray was jailed to the maximum of four years in the pop icon's 2009 death with the judge lambasting the doctor for his "money-for-madness" behaviour. Giving Murray the maximum sentence yesterday, Los Angeles County Superior Court Judge Michael Pastor expressed shock over the doctor's lack of remorse. Pastor said the evidence in the case showed a "continuous pattern of lies and deceit." "He has absolutely no sense of remorse, absolutely no sense of fault and is and remains dangerous," Pastor said ending the seven-week long high profile trial. Under a new state law, Murray, 58, will serve the sentence in LA County Jail rather than in a state prison. The maximum time Murray would spend in County Jail is two years under state sentencing guidelines, said Steve Whitmore, a spokesman for the county Sheriff's Department. Kumar suggests that rather than spend millions of dollars in “inventing” energy-saving devices or alternative sources of energy, “a bicycle fitted with four brooms can be used for cleaning instead of vacuum cleaners or cleaning trucks,” while recalling a similar contraption that he had seen recently. “If you want to do something, you have to be innovative,” says the teenager confidently. 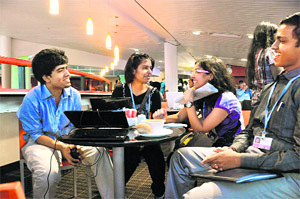 In a fresh attempt to trigger interest among the youth in the looming crisis involving climate change, the Indian government has sponsored four teenagers from different parts of the country, to attend the annual climate change negotiations being held in Durban. After going through a rigorous selection process of tests and essays, administered by the Centre for Environment and Education, the 11th graders are here to observe how the mammoth United Nations conference is conducted. “It is overwhelming,” said Lakshay Rastogi (17) from Gurgaon. Being part of a delegation allows them an inside peek into the nitty-gritty of the intense diplomatic wrangling. For three days now, the four students have watched up-close how Indian negotiators deal with a wide-range of issues including the future of the Kyoto Protocol -- the only legally binding treaty on climate change, which is in jeopardy. With a North-South deadlock on how to reduce carbon emissions, there is a push for making progress on other fronts like adaptation, technology transfer and finance. But progress on these tracks is also painfully slow. “We meet here at a time when greenhouse gas concentrations in the atmosphere have never been higher, when the number of livelihoods that have been dissolved by climate change impacts has never been greater and when the need for action has never been more compelling or more achievable,” said Christian Figueres, the top UN official on climate change. Despite dire warnings, many countries appear to be keen to push the negotiations further down the road. It was recently announced that the 2012 talks will be held in Qatar while outside the conference halls, activists are staging the “Occupy Durban” movement to protest the lack of progress. South Africa’s President Jacob Zuma in his opening address pointed out that the island nation of Kirabati became the first country to declare that its territory has become uninhabitable due to global warming. “They have asked for help to evacuate the population,” Zuma said. “Africa is more vulnerable because of poverty, which limits the ability of most African nations to cope with the impact of climate change,” he added. While she doesn’t see her future as a crusty bureaucrat, Charu Dixit pointed out that knowledge about climate change will be useful for a variety of professions in the coming decades. “If I own a business or build things as an engineer, I will think about whether I am contributing to greenhouse gases,” she said. During their selection process, they were asked to comment on human-induced climate change in the context of Mahatma Gandhi’s ideology of minimalism. Rastogi wrote about khadi that also became a symbol of the independence movement in India and rejection of foreign and machine-made clothing material. Being in Durban, where Gandhi started his battle against racial discrimination, Rastogi has been dwelling more on the test question. “There is enough for everyone's need but not enough for everyone's greed,” he summed up with Gandhi’s famous quote.